The Loudoun County Sheriff’s Office is asking for the public's assistance to help identify two suspects involved in an early morning robbery at an Ashburn store. The Loudoun County Sheriff’s Office is asking for the public’s assistance to help identify two suspects involved in an early morning robbery at an Ashburn store. 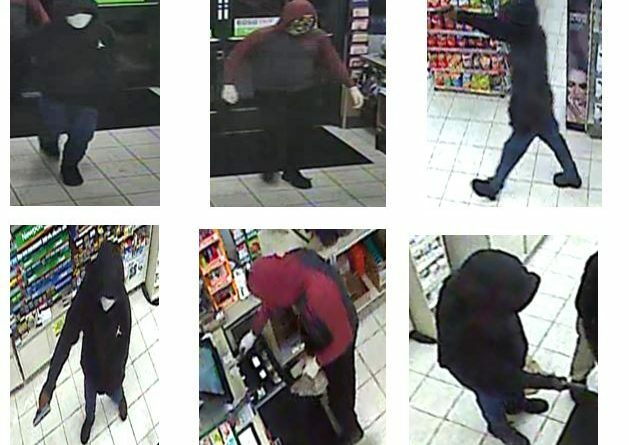 At 1:08 a.m. Monday, two males wearing masks entered the 7-Eleven store in on Ashburn Road. One displayed a handgun and demanded money and the second suspect jumped the counter and removed money from a register. The suspects fled on foot. No injuries were reported during the incident. The first suspect was described as a black male wearing a black hooded sweatshirt, a white mask, jeans and dark shoes. The second suspect was described as a white male wearing a maroon and gray hooded sweatshirt, dark pants and black shoes. The second suspect was also wearing white gloves and a camouflage-style mask. The sheriff’s office released stills from the store’s security cameras showing the suspects. Anyone with information regarding the suspects should contact Det. M. Grimsley at 703-777-1021. Residents also may submit tips through the Sheriff’s Office app.